In this article, we explain the different ways that you can charge VAT/tax to your customers and how it is calculated. To start you need to set a standard VAT/tax percentage that you charge on all your orders unless specified otherwise. Subsequently, you can set custom VAT rates for specific products and destinations. This is very useful if you choose to ship to different countries because each country has different tax rules. You can also select to charge VAT/tax on your shipping costs, either the standard rate or a destination specific rate. Note: A custom VAT rate always overrules the standard rate. If no custom rate is available, the shop will automatically fall back to the destination rate and if that is not available to the standard rate. If possible, stick to one standard VAT rate for your online shop, it is by far the easiest option. If you set up custom rates, the standard VAT rate will always be the default fallback rate. Click Settings and next VAT & Shipping. Check the box for Calculate VAT on orders. Enter the standard VAT rate percentage that you want to charge. Choose whether you want to calculate VAT on shipping. Within the same country or state (U.S.). Within the EU/EFTA to a private person. In all other situations no VAT/tax is calculated, unless you set up a custom rate. Not all products have the same VAT rate, in many countries, for example, printed books have a reduced rate. 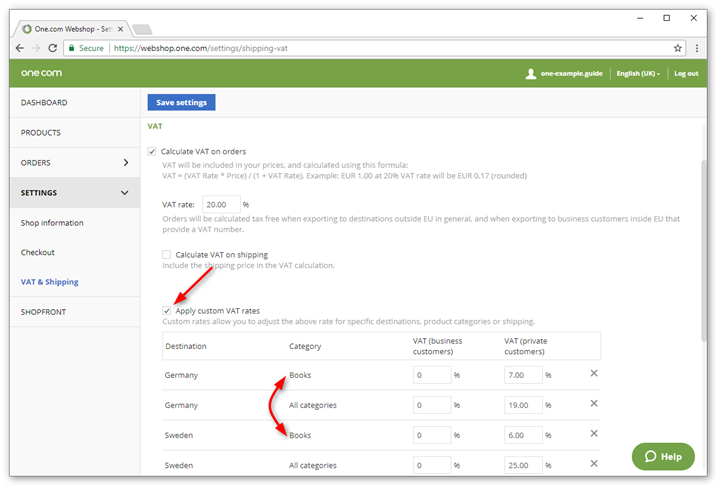 By adding a custom VAT rate you can add a specific rate for a product category and destination. The custom rate overrules the standard VAT rate. Note: When a product is part of two categories that each have a custom rate, the highest rate applies. First, set a Standard VAT rate as described above. Check the box for Apply custom VAT rates. Select a destination and enter a percentage for business and private customers. - Optionally, you can select a product category for which the tax rate should count. Click Add Row (Country) or Add row (State) if you want to add more destinations. VAT is included in the price that you set for each product. This is the price that is visible to your customers in your online shop. This way your customers don't get surprised by "hidden costs" at checkout. The price of a product is 24.00 EUR including 20% VAT. The price without VAT is 24.00 / 1.2 = 20.00 EUR. Your customer will pay 4.00 EUR in VAT. Shipping costs are excluded when calculating VAT. 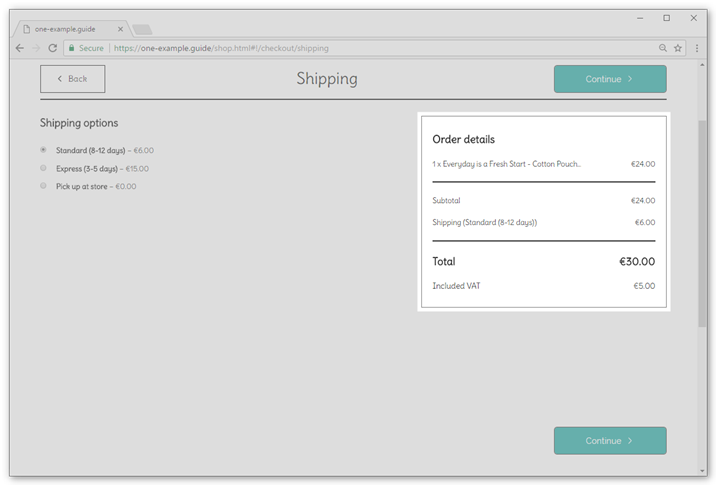 You can choose to calculate VAT on the shipping costs. Then the shipping costs will be included in the total price over which VAT is calculated. The price of a product is 24.00 EUR and shipping costs are 6.00 EUR. Added together this is 30.00 EUR, including 20% VAT. The price without VAT is 30.00 / 1.2 = 25.00. Your customer will pay 5.00 EUR in VAT. You can choose to calculate custom VAT rates, for example, on products that have a reduced VAT rate. This allows you to set different VAT rate on specific product categories. You can also set a different rate specifically for shipping. A customer orders a book for 22.00, including 10% VAT and a bag for 12.00, including 20% VAT. 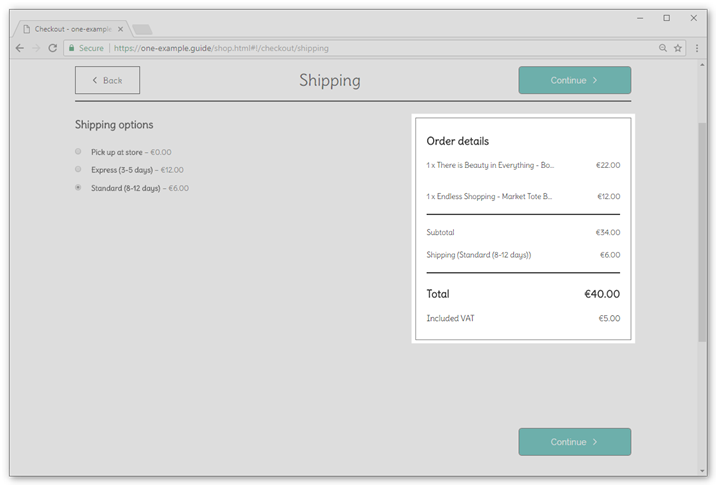 Shipping costs are 6.00 EUR, including 20% VAT. The total price without VAT is then 35.00 EUR; 22.00 / 1.1 = 20.00 EUR for the book and 18.00 / 1.2 = 15.00 EUR for the bag and shipping. Your customer will pay 5.00 EUR in VAT. If you have set different VAT rates for private and business customers, then the price excluding VAT is derived from the price you set for the product in your online shop admin, minus the private VAT percentage. If the price of a product is 24.00 EUR and private VAT is 20%, then the price excluding VAT is 24.00 / 1.2 = 20.00 EUR. 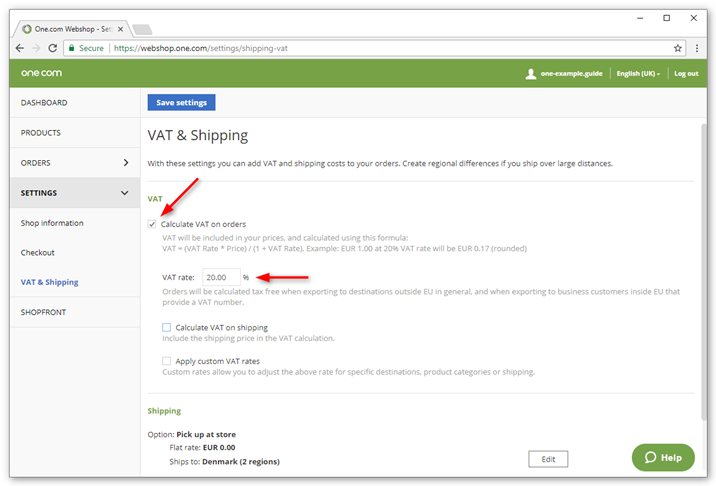 If you set the business VAT to 10%, that means that the price for business customers in your online shop will be 20.00 x 1.1 = 22,00 EUR. However, if you set the business VAT to 25%, that means that the price for business customers in your online shop will be 20.00 x 1.25 = 25,00 EUR. If you have set different VAT rates for private and business customers, then the price excluding VAT is the price you have set for the product. If the price of a product is 24.00 EUR, then that is the price excluded VAT. If you set the private VAT to 20% and business VAT to 10%, that means that the price for private customers in your online shop will be 24.00 x 1.2 = 28,80 EUR and for business customers will be 24.00 x 1.1 = 26,40 EUR.